Pakistan cricket team captain Sarfaraz Ahmed apologised to South African pacer Andile Phehlukwayo in person following his racial remarks against the right-hand bowler during the second ODI of the five-match series in Durban. The wicket-keeper batsman was picked up by the stump mic saying, “Hey black [man], where is your mother sitting? What prayer did you get her to say for you today?” (Abay kaalay, teri ammi aaj kahan baitheen hain? Kya parhwa ke aya hai aaj tu?). 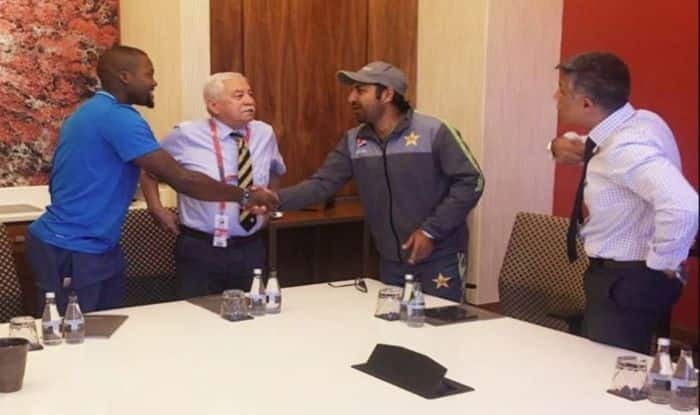 Sarfaraz took to his Twitter handle and shared a picture with Phehlukwayo where both the players could be seen shaking hands. “This morning I apologised to Andile Phehlukwayo and he was gracious enough to accept my apology and I hope the people of South Africa also accept my apology,” Sarfaraz captioned the post. This is the second time that the right-hand batsman has apologised for the incident. Earlier, he had extended his “sincere apologies” for his on-field comment immediately after it turned into a controversy. South African skipper Faf du Plessis had accepted the apology but he cautioned that the team is not going to take the incident lightly. South Africa had won the second match against Pakistan to level the ongoing series 1-1.